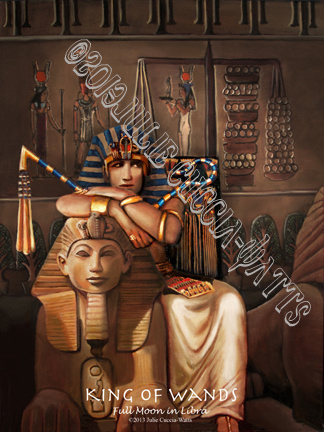 Even if you don’t own (or like) Egyptian-themed tarot decks, The Journey into Egypt Tarot (JIET) by Julie Cuccia-Watts is an outstanding addition to the tarot canon that you just may not be able to pass up. This is like no other Egyptian-themed deck you’ve ever seen or heard of. Let’s get the basic “specs” out of the way before delving into the world of this deck. The deck has a traditional tarot structure of 78 cards (56 Minor Arcana and 22 Major Arcana). Most of the Major Arcana retain their traditional names. The suits are Wands, Swords, Cups and Coins. The artist’s previous tarot deck, The MAAT, used Fire for Swords and Air for Wands and given that in the JEIT the King of Swords looks to be a Roman military leader seated against a fiery backdrop and the Ace of Swords depicts flames, I hazard a guess that the same attributions are used here. The card shape, stock and size appear identical to those of the MAAT: large, square-ish, shiny, highly flexible (good for riffle-shuffling) and slippery…a bit too slippery, in my opinion, so take care if using them on the banks of the Nile river. According to the artist, the cards measure 4.45 inches x 5.5 inches. In my opinion, the imagery is much sharper and clearer than that on the MAAT. Also in my opinion, the cards need to have a substantial width, as they have, in order to provide the best “canvas” for the powerful art—especially the many detailed, movie-like tableaux among the Minors. The JIET is more evidence to support my suspicion that Julie Cuccia-Watts is the most talented artist in the “world” of tarot. To me, the “world of tarot” means people who walk with tarot year after year, long before and long after the publication of their deck. Although taste in art is subjective and not everyone will be as taken with Ms. Cuccia-Watts’ style as I am, I feel confident that anyone who can recognize raw talent will see it here, in the 78 remarkable paintings that comprise the JIET. Let us never forget, too, the depth of intellectual imagination that underlies the systems of Ms. Cuccia-Watts’ latest decks, the JIET included—and more on that below. But for now, let’s talk art. Ms. Cuccia-Watts is likely best known to tarotists for her continually popular deck of the 1990s, the Ancestral Path Tarot. That was a significant enough achievement on its own as compared to the majority of tarot decks in the market at that time. But in the years since, her tarot art has evolved into something really very special. Miraculously, Ms. Cuccia-Watts progressively tops herself, from deck to deck, decade to decade. Constantly adding to her own knowledge and ours, building upon it, learning what is worth keeping and where change could be most valuable. As is usual with Ms. Cuccia-Watts’ decks, the JIET has too many outstanding cards to name. But allow me to offer you the barest hint of the golden treasures to come. Let’s start with the basics. Why is the JIET so different from the other ancient Egyptian-themed decks out there? 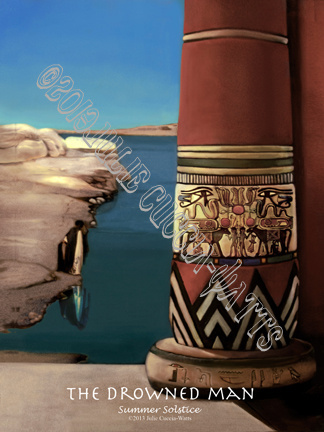 As you can see from the cards—most of which are pictured in the video on the artist’s site, newmoontradingcompany.com—the art style is not the pseudo-Egyptian style of most Egyptian decks; with the exception of a few selected cards such as The Tower, it does not emulate the high stylization of ancient Egyptian wall art and statuary. 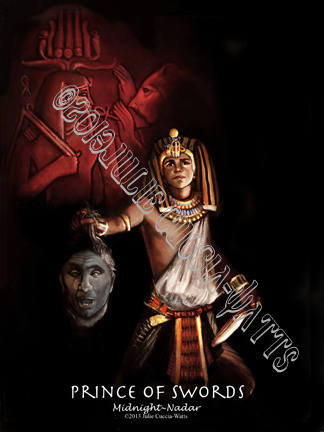 Now, I am a great admirer of ancient Egyptian art. However, in my opinion, it is more highly stylized and two-dimensional than many contemporary tarotists are looking for in a “reading” deck, in something to which they can feel an emotional as well as an intellectual connection. Ms. Cuccia-Watts’ art, by contrast is not only highly realistic, dimensional and dynamic, but also at times sweepingly romantic (or Romantic, to some eyes). It breathes life; it bleeds. This deck’s characters don’t smile or laugh; they guffaw (Justice—simply one of the most joy-inducing images you’re likely to see in a tarot deck). They don’t attend to a project; they pant in childbirth, surrounded by concerned friends or attendants (8 of Coins). They don’t just hold fast to their possessions; an official or aristocrat looks bowed with the weight of his responsibilities or his wealth (4 of Coins). Indeed, in my opinion, the luminous triumph of all Cuccia-Watts' decks is her numbered Minors. No other decks of my experience (and I have a tidy little collection) offer Minor scenes of such visual *and* emotional richness and complexity. There is a strikingly “cinematic” quality to many of this artist’s tarot cards, and nowhere is this more apparent than in the Minors. You turn over a card and you feel as if you’ve walked in on something; your eyes are drawn to the various players and the expressions on their faces, the props in the room with them, the varying motivations each of them may have, their alliances and feuds, loves and hates. If you have struggled with the relative emotional barrenness or symbolic poverty of many decks in recent years—especially flimsy emulations of the Rider Waite Smith deck—you will, with the JEIT, feel like a starving person brought into the banquet hall and offered a dizzying array of complex “dishes” for the mind and soul. What about the Courts, though, you might wonder? Even the best artists can struggle with differentiating and enlivening the static Court card figures. As with the numbered Minors, those of you who have struggled with court cards (and that’s most tarotists) will revel in JIET’s sweepingly cinematic tableaux. The Knight of Swords (Prince of Swords) isn’t an invincible robot on the battlefield, but a thin young boy holding aloft a decapitated head with an expression of mingled determination and concern on his young face; becoming a warrior isn’t easy on the hero himself. The Queen of Swords may be a solitary woman as traditionally associated with this court card, but here she has a heart about it—anguished tears flow down her clenched fist as she cradles the empty helmet of a Roman soldier, perhaps her departed lover. The Queen of Coins grins indulgently at the antics of the toddler she’s perched up beside her on her throne. I’ve never seen a King of Wands so thoughtful and ambivalent in expression; if Wands do represent Air here, I can see just how this fits. The Queen of Cups kneels at the base of a flight of stairs, looking up apprehensively at something we can’t see, and the adept shadowing of the artist’s paintbrush mimics the spotlight of a master Hollywood cinematographer on the elegantly-rouged face of his glamorous leading lady. What about Majors, you ask? Each one is better than the last. Some of them are renamed—The Drowned Man for The Hanged Man—but most are traditional, including The Devil and Death. (For those who are wondering, The Devil is a mysterious and ambivalent image, not a traditional tarot hoofed beast or the artist’s own unconventional childbirth interpretation in the MAAT). 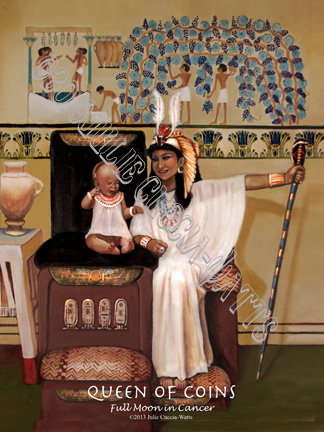 The Magician (representing the Full Moon Cycle of Cancer) is another of Ms. Cuccia-Watts’ breastfeeding mothers and, regardless of how you feel about this choice of image for this Trump, the card is artistic perfection—a tableau of the quiet power we can harness in the still minutes before sunrise. The Hermit (representing the Full Moon Cycle of Capricorn) is a young and vigorous man with a staff in one hand and a flare of solar light in his other, adding a layer to our traditional understating of this archetype. 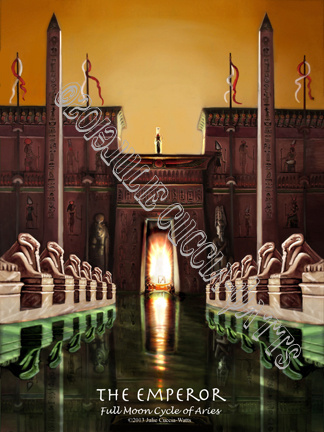 The Emperor is not even a “he.” Beautifully fitting, it’s a painting of the awe-inspiring majesty of ancient Egyptian architectural prowess and civilizational might: a great Nile-front temple or palace and the dozens of stone sphinxes lining the watery path to the massive arching doorway. Perhaps you are saying to yourself at this point, “Yes, the art is grand, but I have trouble with the very fact of an Egyptian-themed tarot deck.” This is something we should talk about. In other (i.e. non-tarot) realms of the artistic and literary worlds, there has been much very valid and important discussion about cultural appropriation, appropriation of “voice,” etc.—particularly in situations in which a majority-member artist renders or writes about peoples who have not often had a chance to represent themselves on the world artistic stage. Egypt certainly falls into the latter category of people---ancient Egyptians, because much of their culture and religion is no longer actively in force, and modern Egyptians as an ethnic group in a developing country that has not produced a large number of world-class visual artists (its writers have fared somewhat better but are still by no means the dominant force in the international writing scene). I believe that as tarotists we should always at least consider the question of cultural and ‘spiritual’ appropriation when it comes to our decks. We should question the glut of Egyptian-, Native American/First Nations- and pan-Celtic- decks in the market and what that means for us as users of these decks and as people who are trying to respect traditions that likely have no organic connection to tarot whatsoever. Some decks, we will instantly find wanting in this regard and thus dismiss—they are exploitative, or thoughtlessly inaccurate, or unwholesome mishmashes of the deck creator’s idea of what “Native” or “Egyptian” spirituality should be. JIET works for me where many other similar “culturally themed” decks fail, and I’ll share why. First, Cuccia-Watts’ very artistic style, which I have lauded above, breathes life into otherwise tired old stereotypes. In the West, we are used to an image of the ancient Egyptians that is far from human: they are presented as two-dimensionally as their famous stylized art, and they come off more as aloof, silent figureheads of a beautifully alien culture and religion than as fully-realized human beings. Even when they are brought to life for us in the movies, countless old Hollywood films based on Hebrew Bible stories cast the Egyptian characters in the role of the hard-hearted, the cruel, the emotionally-detached (as compared to the relatable, suffering Hebrews). Again, as a result, many people feel an emotional detachment from the ancient Egyptians even while revering their great artistic, scientific and architectural achievements. Ms. Cuccia-Watts’ cinematic, emotionally-charged artistic style animates people who are otherwise distanced and objectified in the minds of the public at large. With the sweep of her paintbrush, she portrays laughing goddesses, grieving Queens and thoughtful Kings, passionate craftsmen and intelligent architects, and starkly beautiful scenes—often presented in elegant black silhouette against a glowing orange sky---from the everyday lives of the farming classes who work the land. Suddenly, we have traveled across time--and, for most of us, space---to spend a few hours with some friends, lovers and enemies who happened to live in ancient Egypt. This is also the first tarot deck—including Ms. Cuccia-Watts’ own past decks—or indeed any artistic enterprise I’ve seen that showcases the richness and diversity of Egypt’s population. I do not know this for a fact, and I may be wrong (I have not yet read the companion book to this deck) but it appears to me that the artist has made a conscious decision to include characters from at least five of the ethnic backgrounds that populated Egypt during the depicted periods of time: indigenous Lower/northern Egyptians as characterized by golden/brown-skinned characters with distinctively Egyptian features that would not be out of place on the streets of Cairo today; indigenous Upper/southern Egyptians and Nubians as characterized by the darker-skinned characters and as one would also meet on an excursion to the temple ruins of Upper Egypt; visiting or immigrant populations from tribes in other, more southerly parts of Africa; the ruling Greeks/Macedonians (a la Cleopatra, although I don’t know which cards, if any, depict her specifically); and the ruling Romans (I suspect, based on their dress, that the latter comprise the identifiably European characters with lighter skin). I did not identify any overtly Hebrew characters but they may well be there and I will notice upon increasing my use of the deck. 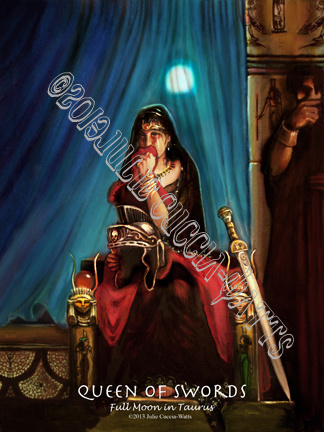 Such historically-flavored diversity is fairly unheard of in most Western artistic depictions of ancient Egypt (the less said about those miscarriages the better) and I commend the deck creator for taking pains to include it in her deck. All in all, you will have to come to your own decisions about this deck and whether or not you feel it’s an acceptable appropriation of ancient Egyptian culture, religion and people. In my opinion, for the reasons above, it is one of the best such appropriations among tarot decks and, to the extent that one can accept the very possibility of a non-Western culture pressed into service for a European medium (tarot), I think you will find this deck respectful of the peoples and cultures that inspired it. 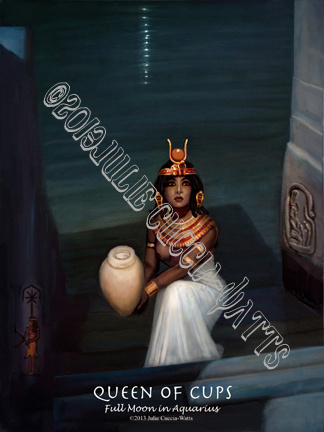 (The “although” is that I am an enthusiastic embracer of decks on their own terms, using their own systems, and I think the use of JEIT will be enriched by reading the companion book and gaining a bit of knowledge of the system, as I strove to do with her MAAT Tarot). Beginning with the Blue Moon and MAAT tarots and continuing into the JIET, this is never the case with Ms. Watts, who is a serious student of astrology and has developed her own complex-yet-graspable systems underlying the structure and characters of her deck. There is intellectual effort behind these great undertakings, and that alone is enough to distinguish the deck from the majority of contemporary ones. In the case of the JIET, Ms. Cuccia-Watts has designed a system based both on real sky astrology and the calendar of ancient Egypt. From what I understand, that calendar was an organic part of the fabric of ancient Egyptians’ lives given that it was based on the seasonal rhythms of the Nile river, the basis for Egypt’s entire, multiple-millennia civilization. She has written that the numbered Minors are also based on numerological concepts derived from ancient Egyptian culture and philosophy. The 78 cards are divided into different real sky moon cycles as they progress through the year/seasons and arranged in that order when you first open your deck box. Each cycle contains Majors, numbered Minors and Courts that have been physically gathered together to represent the cycle into which they fall. Each card has a caption underneath its traditional title to designate where it falls in the cycle e.g. The Prince of Cups is Sunset-Descendant; the Queen of Cups is Full Moon in Aquarius; the Drowned (Hanged) Man is the Summer Solstice; The Sun is the Winter Solstice, etc). For more detailed information on the astrological system upon which this deck is based, you can visit the creator’s astrology page on her site and the Aeclectic Tarot Forum’s study group for the deck: http://www.newmoontradingco.com/real...on_cycles.html and http://www.tarotforum.net/showthread.php?t=192971 . In my opinion as a tarotist with experience of many decks spanning several different systems, you do not have to delve incredibly deeply—or really, at all—into the astrology of Ms. Cuccia-Watts’ decks in order to enjoy and benefit from them. The gripping emotional power of her art truly is sufficient to trigger a magnificent reading—especially self-readings---even in a less-experienced tarotist. Her decks are ideal for so-called “intuitive”-style reading because of that. As a system-centric person, I usually try to make an effort to get the basics of what the creator was aiming for when creating their deck, but if you prefer to read purely based on the pictures of cards (or if you want something with scenes that don’t openly contradict the Rider Waite Smith and often even are congruent with them; see the 4 of Swords or 6 of Swords, for example), you’re in business with the JIET. It is worth noting that some have suggested that the systems underlying some of Ms. Cuccia-Watts’ decks (the Blue Moon/MAAT) have been flawed in some way relating to the astrology. 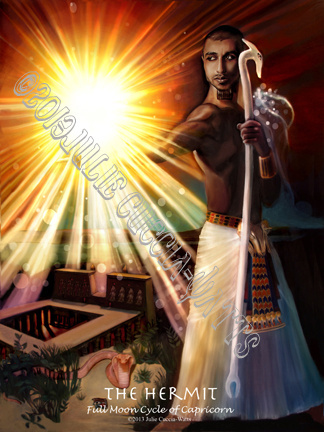 I am not versed in the science and art of astrology, although I try to understand enough to gain a fuller understanding of the tarot systems (such as the Golden Dawn or such as this artist’s own MAAT deck) that make use of astrology. I don't know about all you tarotists out there, but I am more impressed with those who reach higher and make ventures of great scope—and who, as a result, experience bumps along the way—than with those who play it safe and do so to predictable perfection (see “the artist who sits down with a copy of the RWS and a how-to book,” above). And that, fine art aside, is, I believe, the overwhelming strength of Ms. Cuccia-Watts’ work: it is "along the way." There's a journey here, a progression, a cumulative narrative. Isn't that an analogy for tarot itself? Or for our lives? Although I do not know Ms. Cuccia-Watts personally, I sense that she is that increasingly rare tarot artist and deck creator who lives and experiences personally, for herself or himself, the internal growth that tarot has to offer us. This can't help but come through to her audience as we use her decks, and I am grateful for this artist and deck creator’s continued pushing of boundaries—both her own, and ours. I wish you all the most potent of epiphanies and exciting of adventures as you embark on this Journey into (Julie Cuccia-Watts’) Egypt.